Dental students at King’s College London are using technology work stations to learn how much pressure they should use when drilling. The device, known as HapTEL, is based on tactile feedback technology through which the user can sense touch and force in a virtual-reality environment. 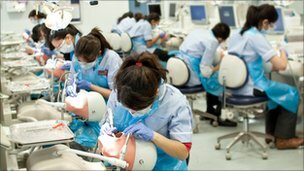 The work station lets the student feel the difference between drilling hard enamel and softer decayed tooth and helps them learn how much pressure is needed. Professor Margaret Cox, who led the project, says, “When the students first learn, they lean very heavily on the drill and go straight through the tooth to the gum … This (tool) allows the student to learn both skill and speed.” Currently the work station is a development system, with each unit having to be made and calibrated individually. It is hoped that it will eventually become a plug-and-play system that allows students to practice in the library or dentists to brush up on their skills at home.